Online Race Registration Now Active! NOTE: race date has been changed due to flood damaged road construction! Watch this space for more information on the run. To provide our community, young and old alike, with the opportunity to perpetuate the culture and art of Hawaiian canoe paddling. We desire to create a positive environment based on mutual respect, rather than a win at all costs attitude. Our goal is to instill good sportsmanship in every facet of our club. Our club is open to everyone from 8 years old and up. Interest, enthusiasm, and willingness to participate are the only criteria. Through the use of positive encouragement and training, we strive to give everyone the opportunity to be the best that they desire to be. Move our club forward as one, encompassing our Youth, Adult, and recreational programs. The Hanalei Canoe Club paddling season runs from February through October, starting with long distance racing. The regatta or sprint races begin in May, and culminate with the HCRA State Championship Race in August. The long distance season continues with the Na Pali Challenge here on Kauai, Queen Lili‘uokalani Race on the Big Island at Kona, and the biggest challenge of the season, the 41.8 miles race from Moloka‘i to O‘ahu. It's truly an experience to remember. Our club consists of two divisions; the Youth Division is made up of girls and boys 10-18 years of age, the Adult Division is made up of women and men 19 year of age and up. Each year we sponsor the Tai Hook regatta at Hanalei Bay. Our three major fundraisers to help defray operating costs that include annual insurance dues and the upkeep of our facility and equipment, are the Haena to Hanalei 8-Mile Run/Walk in June, the Hanalei-Tahiti Fete in July, and the Luau at the end of July. Being a member of Hanalei Civic Canoe Club is a wonderful, unique experience. You have the opportunity to make friends, learn to work as a team, and strengthen you mind and bodies. Hopefully we take all that we learn with us and apply in our every day lives. We are truly blessed to be able to paddle our canoes in a place as beautiful as Hanalei Bay! 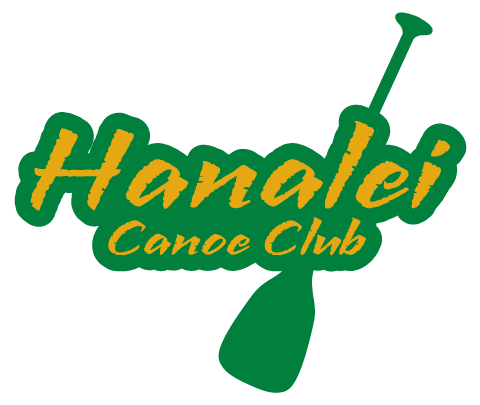 The Hanalei Canoe Club was founded in 1973 as a community outreach program of the Hanalei Hawaiian Civic Club. The mission of the Hawaiian Civic Clubs is to serve in advocacy of the Hawaiian culture, health, economic development, education and social welfare of its people. As such, when Stu and Shirley Kalama approached the Hanalei Hawaiian Civic Club to start the first canoe club on the north shore of Kauai, they agreed! Shirley and Stu generously lent the club its first canoe –the Po’okela, and the Hanalei Canoe Club was launched to help perpetuate the ancient art of Hawaiian Outrigger Canoe paddling. The Hanalei Canoe Club was initially part of the Hui Wa’a Canoe Racing Association. Hui Wa’a allowed clubs without the traditional koa canoes to belong to and race in their canoe racing association. This opened the door for clubs in many communities that, not being able to afford a koa canoe, would otherwise not have been able to paddle and compete. Kapeka Chandler was instrumental in the early days and until her death in helping support and grow the club – actively fundraising to support the club and so that the youth and their families could travel and compete. In 1979 Hanalei Canoe Club acquired their first traditional koa canoe – the Kai’Opua, and joined the Hawaiian Canoe Racing Association (HCRA). In 1982 the Hanalei Canoe Club caused the biggest upset in state history, becoming the first outer island canoe club to win the HCRA championships! In addition to the Kai’Opua, Hanalei Canoe Club dreamed of obtaining a koa canoe for open ocean racing. This dream was realized in 1987 when our Hanalei men’s crew won first place in the Oahu to Kauai, Na Holo Kai Sailing Canoe Race. The first place award was a koa log. Master Canoe builder Wright Bowman, Jr., designed and built to our specifications a koa canoe from that log, named Na Holo Kai. Initially our canoes were kept at Black Pot Beach. Eventually through the generosity of the Wilcox family, we moved to our first canoe hale on the Hanalei River. In 1989, again with the generosity of the Wilcox family, the Hanalei Canoe Club was able to move to the land on the Hanalei River where our clubhouse / hale is still located. After Hurricane Iniki devastated our original clubhouse, it was rebuilt in time for our 20th anniversary and is the beautiful clubhouse you see today. In 2008, Hanalei Canoe Club sponsored the then new West Kauai Canoe Club to help support and expand the art of outrigger canoe race on Kauai’s West side. Over the years, HCC has been blessed with many wonderful, talented, and inspiring coaches. A special mention must be made for Kainoa Chandler Forrest, our Head Coach for the women’s team from 1990 to 2009. Kainoa passed away too soon in 2010. Over several years the Na Holo Kai, was completely rebuilt and refurbished by Bobby Puakea, with the help of many of the Hanalei Canoe Club youth, paddlers and coaches. It was completed in 2012 and renamed the Kainoa Hola Kai and continues to be our cherished koa racing canoe. Kainoa’s daughter, Lilinoe Forrest, assumed her mother’s position as Head Coach for the Women’s Team and continues to coach today. Throughout the years, Hanalei Canoe Club has continued to thrive and grow. The Hanalei Canoe Club has won every Garden Island Championship race and youth, men’s and women’s teams have won many HCRA State Championship medals throughout the years – bronze, silver and gold! Our men’s crews consistently place in top 10 in the Molokai Hoe and our women’s crews often place top 20 in the Na Wahine O Ke Kai. Many gold medals have also been one by both our men’s and women’s crews at the Queen Liliu`okalani race in Kona. The Hanalei Canoe Club proudly participates in community outreach providing educational outreach with our local schools, Make A Wish Foundation experiences and more. Hanalei Canoe Club has participated internationally in Outrigger Canoe Races (6 man, 1 man, World Sprints and Swan Boat), sending teams to Tahiti, Thailand, Australia and New Zealand. WARNING: There is currently no access to the canoe club hale due to last years flooding that damaged the end of Weke Road. As soon as repair work has been completed and access restored to the hale we will update these directions.